There's lots of bad stuff in store for our country (and the world) as the economy continues to derail and careen into a brick wall. 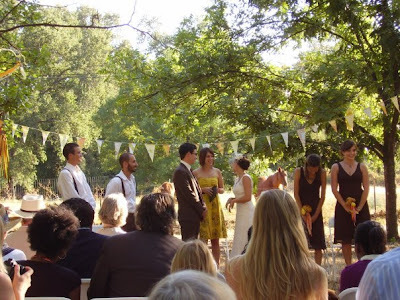 But, I do think it will have at least one positive effect: More backyard weddings. I am oh-so-late to feature this September wedding, but I simply must. I wish these people were my friends. I mean, a bride who's willing to let down her fancy hairdo and actually get down (I mean literally down) on the dance floor? 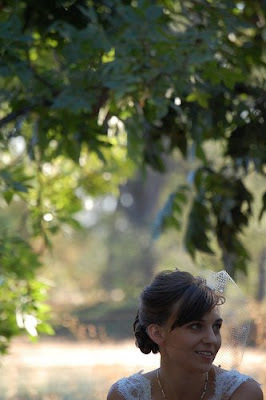 Oh, A Backyard Wedding, if only you gave us more frequent blogging insight into your wedding world! I'll be posting more now that I have pictures!